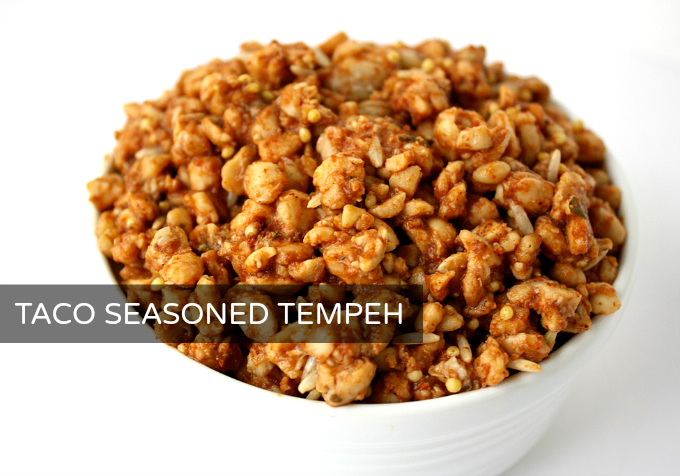 I love using tempeh as a ground meat substitute! Most often I use it in pasta sauce, but it’s awesome in so many other dishes as well. These Black Bean Tempeh Tacos were an early recipe I posted on the site, but I’ve revised it over the years and wanted to update the photos as well. Tacos are always a great choice for weeknight meals – quick, easy, delicious! Plus everyone can personalize their own with the toppings they love. These are pleasantly filling, with a double protein punch from both the beans and tempeh. (For us, each taco has over 10g protein!) My favorite toppings are avocado, lettuce, and juicy pico de gallo which pairs wonderfully. Let’s get this taco party started! 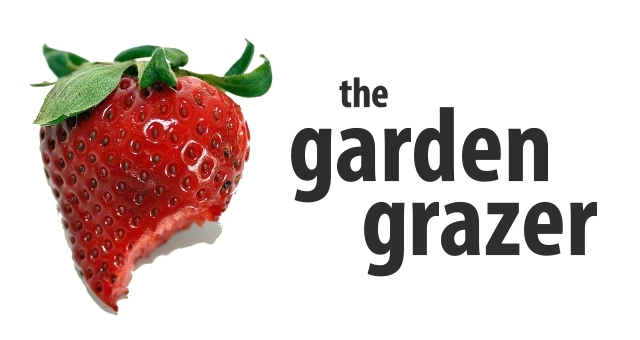 PS – come join The Garden Grazer on Instagram 🍓 and share a photo if you make this! I love seeing what you guys cook up. 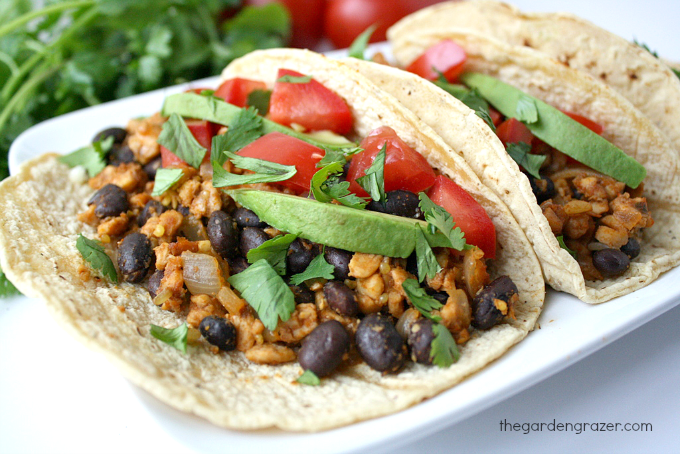 Easy, delicious Black Bean Tempeh Tacos! 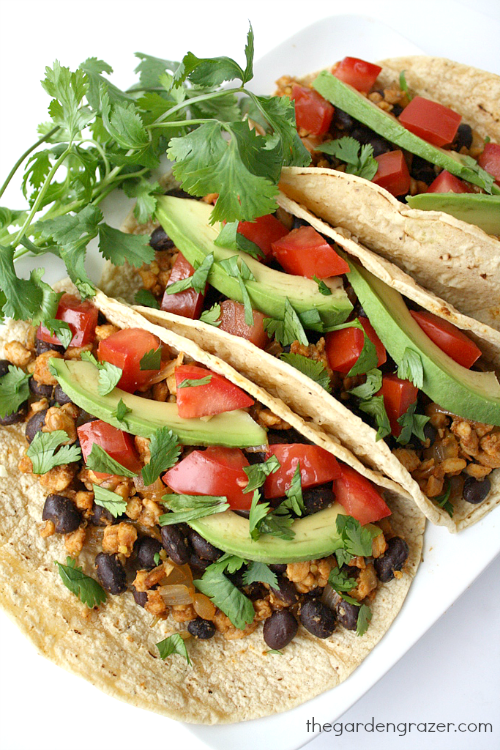 Each taco is packed with about 10g protein and makes a great 30-minute weeknight meal! Toppings of choice: nutritional yeast, pico de gallo, lettuce, tomato, cilantro, avocado/guacamole, etc. Crumble tempeh and place in a bowl. Mix the taco seasoning with 2-3 Tbsp. water and add to tempeh. Stir well to combine and set aside to marinate. In a pan over medium heat, saute onion and tempeh for about 8-10 minutes. After onions have softened, add minced garlic to the pan and cook 30 seconds. Add black beans (rinsed and drained) and cook about 3 minutes or until heated through. 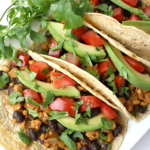 Assemble tacos: warm the corn tortillas if desired, add the tempeh mixture, and any toppings. Made gluten-free with GF tempeh and tortillas (I use corn tortillas). The look fantastic! I have just discovered tempeh and am loving all of the great recipes using it. Since you love tempeh so much, you might be interested in our website showing our easy method for making tempeh at home: makethebesttempeh.org. We produced Betsy's Tempeh in Mich. for 9 1/2 years and sold out tempeh in both patty and grated form that our customers loved. Feel free to write with any questions or comments you might have. I usually use soy crumbles in my tacos, but I really should try tempeh! Recipe doesn't indicate if beans should be drained or not; I did drain them before adding to the pan, along with about a quarter cup of salsa, muy bien!! Hi Patty! Yes! Good catch 🙂 I just updated the recipe to indicate rinsing and draining – thanks so much for pointing that out. So glad you enjoyed these! Have a beautiful weekend! OMG, these were so good. As I noted on Pinterest, I only had baby kale and fresh lime for toppings. So I made some taco sauce (Pinterest recipe). Used soft whole wheat tortillas that I heated right on the stove flame (love gas). Oh, I also didn't have taco seasoning so I made some (Pinterest again). Squirted taco with some hot sauce – Voila! Will definitely make again. Thanks for this wonderful recipe. YUM!!! Love your adaptions 😀 So glad you gave them a try and enjoyed! Thanks for your sweet comment. Happy Friday!! Great recipe !! Does the tempeh need to be frozen or un-frozen? How long should the tempeh marinate for? I'm used to marinating tofu and I usually marinate that for 30 minutes. Just made the recipe tonight. Was very good. I used some canned black beans that were already cumin flavored. Just made these tacos tonight for dinner and my husband absolutely LOVED them. Will definitely be making more of your recipes for my family! !